Anybody who has ever seen a lotus flower growing and emerging from a dirty pond can't help but see the beauty and deeper meaning that this exquisite plant provides. From muddy waters beauty emerges, and the lotus flower shall always rise above the mud. This is such a great a symbolism for life as well, that trying times and difficult situations that are hard to navigate can ultimately lead to beautiful outcomes and help to grow into even better human beings. My dad had a pond in our backyard and I remember watching and waiting for the lotus flowers to make their appearance and blossom into the beautiful flower they were destined to become. The Pink Lotus Flower is the supreme lotus and is considered to be the true lotus of Buddha. I used the Buddha from the Relics and Artifacts Deity Trio as the centerpiece for my Lotus Blossom. My Lotus Blossom is painted up with acrylic paints. I really love how the ombre on the petals looks. 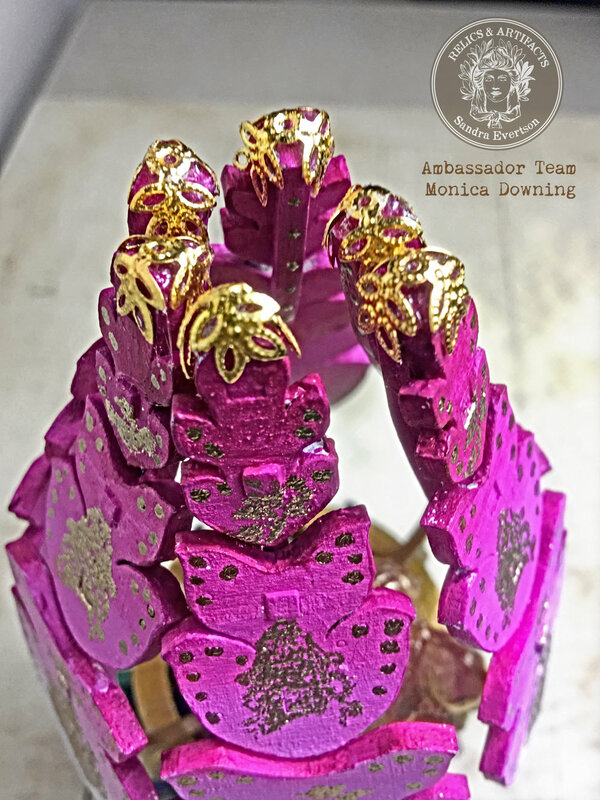 The gold images on the outside of the petals are done with stamps and gold embossing powder. The other details in gold are done with a liquid gold metallic pen. This piece was challenging because I had to paint it after it was completely put together. I was up for the challenge though and I love how it turned out. I made a 3 part video on how to put the Lotus Blossom piece together, which you can find in the Relics and Artifacts Facebook Tribe. Ann Sullivan Barnes did an awesome step out tutorial as well and it is also posted in the Facebook RELICS & ARTIFACTS Tribe.